It was all supposed to be straightforward. A Ferrari-v- McLaren-Mercedes title fight, with Kimi Raikkonen leading the former and Fernando Alonso the latter, each supported by their respective team-mates. 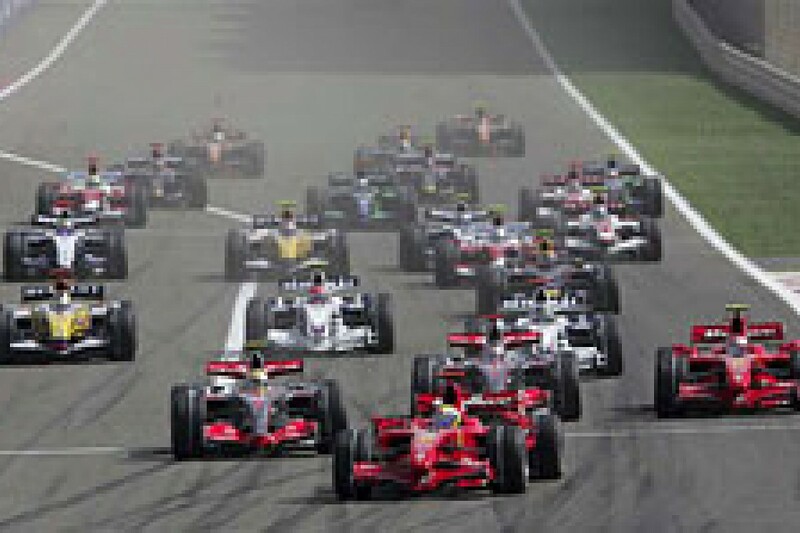 But Bahrain was a battle exclusively between the supposed support men, Felipe Massa and Lewis Hamilton. 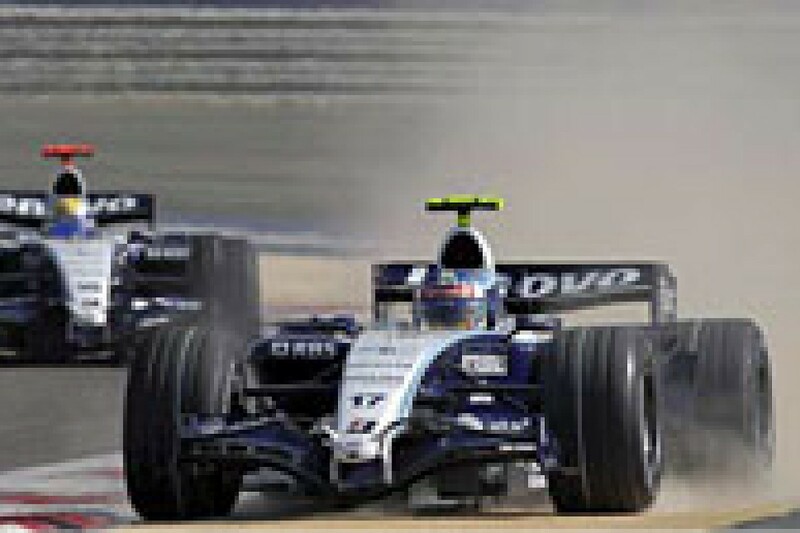 Massa was faultless in victory, just like in Turkey and Brazil last year - although, just as in those races, his team-mate was stuck for most of the afternoon behind a slower car. Hamilton was in inspired form - again - and made history by being the first guy to take podiums in each of his first three grands prix. Better than that, his race was a sensational flurry of all-out attack, beginning to end, trying to make amends for being outqualified by Massa. Because that's all that really separated them. On Sunday the difference between Ferrari and McLaren was so small that it was decided on track position, and therefore in Massa's favour as the pole position man. Hamilton gave inspired chase, but his McLaren wasn't faster than the Ferrari when it needed to be, only during a couple of intervals at the beginning and end. In the heat of Bahrain - only a little lower than in Malaysia - Ferrari still had its bodywork 'opened out': in other words, its aerodynamic performance was still compromised by the need to run additional slats in the upper bodywork atop the sidepods for cooling purposes. But, unlike in Malaysia, the cooling problem wasn't so critical that Ferrari needed to reduce the heat rejection by lowering the revs. 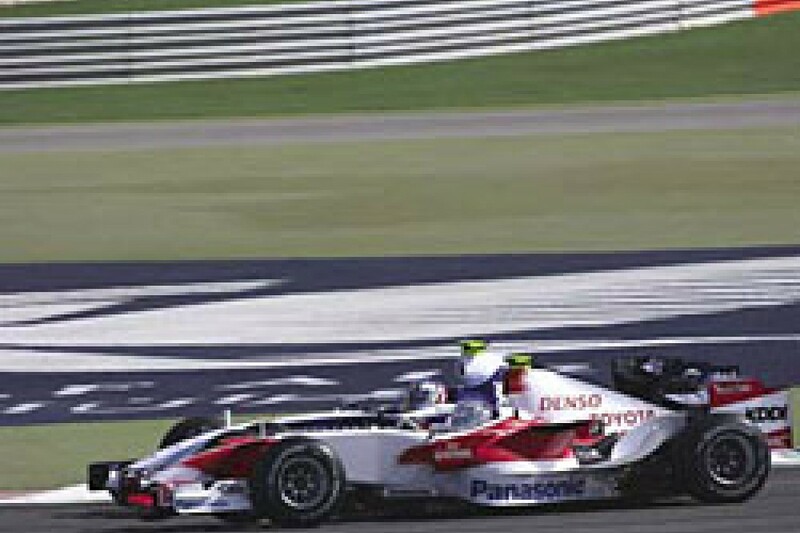 With this aero/ engine combination, the F2007 had maybe a 0.1sec raw-pace advantage over the McLaren MP4-22, not enough to guarantee victory, but ultimately decisive. Particularly when combined with Ferrari's greater experience of Bridgestone rubber on a day when it was very important to understand the track and tyres. Add to all this Massa's excellent qualifying lap and Hamilton's slightly compromised one, and there are all the reasons why we had the result we got. Neither of these guys was troubled by his superstar teammate, and the reason for that was largely Alonso's unease with his McLaren's brakes throughout the weekend. There was nothing technically wrong with them, but he just didn't like their feel in the many big-stop corners, especially on a blustery, low-grip track. This defined his race pace as slow - and ensured that Raikkonen, who was trapped behind him for all of the first stint, was never in the picture. On the very same brakes, Hamilton was just fine. But Hamilton is beginning to amaze the McLaren personnel with his ability to drive at the same pace, regardless of any changes in the characteristics of his car. They are beginning to hold him in awe. Raikkonen paid the penalty for getting caught in traffic on Saturday, for being outraced by Alonso on the first lap and arguably for being halfasleep on the restart from the safety car, when he got left behind on one of his few opportunities of passing Alonso. Being stuck behind the struggling world champion left him too far back by the end of the first of the race's three stints for him to do anything about either Hamilton or Massa. In Bahrain both supposed team leaders got a big wake-up call. In Alonso's case this point was forced home by Nick Heidfeld, flying in the BMW, going clean around his outside at turn four in the middle stint - and staying ahead until the flag. 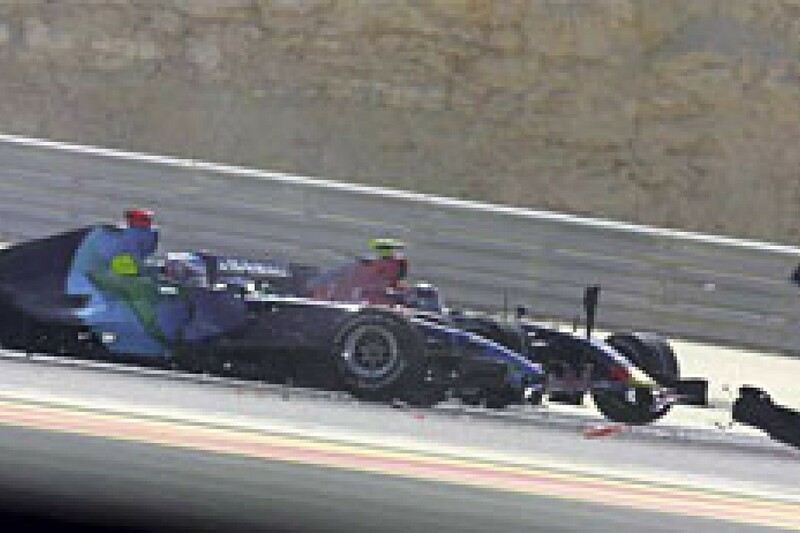 Massa made one mistake on Sunday - he sped through the pitlane. Luckily it was before the race had started, and so all it cost him was a fine. Otherwise, under big pressure after the errors in Malaysia, he did a fine job. Away from the line he didn't have the compromised gearing/ engine of Malaysia, and so was able to cleanly convert his pole into the lead by the first corner, with Hamilton unable to get close enough to try his usual heroics there. Lewis, in fact, was busy jinking around to keep Alonso behind him, which he succeeded in doing. Raikkonen tried around the outside of Alonso in turn one, this getting him ahead for the inside of the linked second turn. At this point Raikkonen was thinking of trying to launch an attack on Hamilton as they raced up to three, "but I started understeering towards him. It was getting too close and I had to back off." This made him vulnerable to counter-attack by Alonso, who drove around his outside through turn four. Behind were the BMWs of Heidfeld and Robert Kubica, ahead of a great gaggle led by Giancarlo Fisichella's Renault. At the back Adrian Sutil's Spyker had whacked Jenson Button, the spinning Honda then taking out Scott Speed. Sutil continued pitwards for a new nose, but Button and Speed were out and, with the Toro Rosso sitting in the middle of the track, the safety car was deployed. It stayed out until the end of lap three, with Massa trying to make a surprise break before they arrived at the corner onto the pit straight. But Hamilton and Alonso were ready and went with him. Less alert was Raikkonen, who was left fumbling, and came past the start/finish line already 2.3sec behind Alonso. With the first stint finally properly under way, a pattern soon emerged of Massa and Hamilton sprinting away together, as if tied by a piece of string. Hamilton was running a couple of laps lighter (worth around 0.2sec per lap) and it looked for all the world as if he could have pulled away had he been able to get past. But the Ferrari's straight-line performance was superior to the McLaren's, thus preventing Lewis from being able to get a run. That said, all it would have taken would have been a bobble from Massa through turns one/two and Hamilton could have got a run going up to turn four. But Felipe, who all weekend seemed to be carrying a cold determination to make amends for Malaysia (and to make sure he did not fall into the team numbertwo role), was not to be flustered. Behind, Alonso was consistently 0.5sec per lap slower - significantly more than would be accounted for by his extra lap's worth of fuel over Massa. The champion simply had no confidence in his car: "I was struggling for pace and grip and I just couldn't drive the car as hard as I would have liked. You always start the race believing you can win, but after six or seven laps I knew it would be tough." Sakhir is a circuit that demands a very hard brake-pad material if you want them to last the race. The problem with a hard pad material is that it makes the pedal feel inconsistent and liable to grabbing at the parts of the circuit where the brakes have cooled. Alonso's driving style relies heavily on the brakes to aid with direction change and, with the McLaren's Carbone Industrie pads, he just could not get the confidence he had in the Hitcos he had on his Renault here last year. Consequently he simply could not drive to his maximum - particularly with a blustery wind and a track surface that was sandy off line. Hamilton's more conventional style, with later turn-in and less reliance on the brakes to help the direction change, was not so sensitive. The safety margin Alonso felt he needed lost him any touch with the leaders - and did for Kimi's chances too. By the time Hamilton kicked off the first of the frontrunners' stops at the end of lap 19, Alonso/Raikkonen were more than 10sec adrift and effectively out of contention. Massa stopped on lap 21, with Alonso and Raikkonen following on 22 and 23 respectively. Ferrari did two very significant things at this round of stops: it elected to fuel Massa for a middle stint of just 19 laps; and Raikkonen for 18. McLaren, by contrast, loaded Hamilton for 25 laps and Alonso for 21. Although this allowed Raikkonen to spring himself ahead of Alonso, normally the Ferraris' short-fuelling would have given McLaren the strategic advantage going into the final stops, allowing them fast low-fuel laps to buy them position. But it didn't work out like that. And this is where Ferrari's much greater experience of Bridgestones really told. For one thing, McLaren opted to increase the tyre pressures to compensate for the heavier fuel loads - but went too far and suffered a lack of grip as a result. For another, the track finally began to properly rubber in for the first time all weekend, something that would allow the hard compound that everyone fitted for the final stint to work quite well for the first time. This meant it was not necessarily advantageous to stay out longer, because the newtyre grip of even the hard compound could more than compensate for the refuelled car's extra weight. Ferrari had anticipated this perfectly, McLaren hadn't. What it all meant was that the two Ferraris in first and third were flying in the middle stint, and the two McLarens in second and fourth were struggling. "Yeah, I had some oversteer in the first stint," related Massa, "and I had more front wing put on for the second, and then the car became very good. I just pushed every lap to open up the gap and give myself a cushion for later." At the beginning of the stint Hamilton was just 3.5sec behind Massa and 6sec clear of Raikkonen. By the time Massa pitted on lap 40, Hamilton trailed by more than 10sec and had Raikkonen right up his gearbox. In this second stint, freed from following Alonso, Kimi's pace had been excellent, even slightly faster than Massa's up front. But though he was able to get onto Lewis's tail by the end of the stint, he was unable to pass. Once onto the hard rubber and low fuel load for the short final stint - and without the unsuitable tyre pressures - Hamilton's car was finally quick again, and he began hunting down Massa's lead and pulling away from Raikkonen. 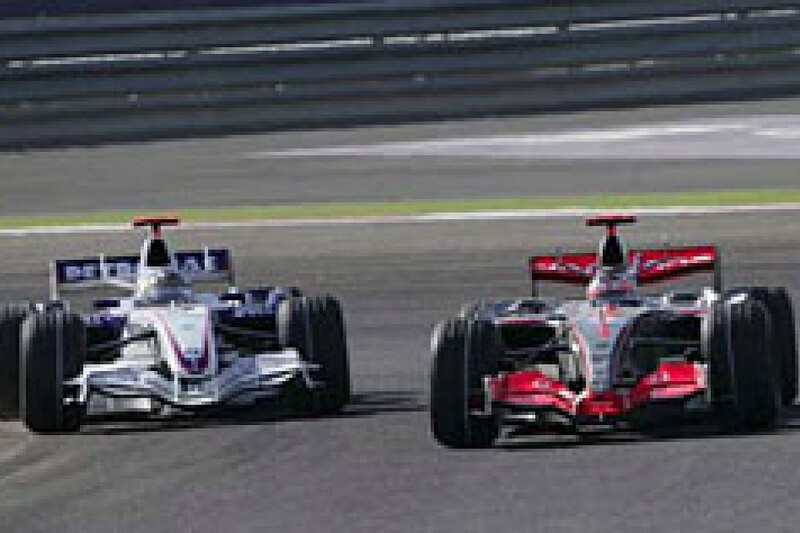 Team-mate Alonso had suffered similarly to Hamilton in the second stint - to such an extent that he became vulnerable to Heidfeld's BMW. Nick had been driving another excellent, error-free and relentless race, staying right with Alonso/Raikkonen through the first stint and then pressuring Alonso into the second. "I just tried to stay as close to him as possible," said an elated Heidfeld, "to try to pressure him into a mistake." The error duly came on the 31st lap as Alonso got slightly out of shape through the final corner, was slow onto the straight and forced to take a defensive line into turns one/two. Resisting the temptation to try for the outside, Nick took up a clean line through there and was quicker on the exit, so forcing Alonso to defend all the way down to turn four too. At this point Nick drove around the outside, wheels almost touching, holding Fernando in - and proceeded to pull off the move of the race. "When we were on the hard tyres in the final stint he was faster than me again," continued Heidfeld, "but I knew if I just concentrated on making no errors I could stay ahead." The BMW had enjoyed no further development since Malaysia, where it had been 0.5sec off the pace of the fastest car. But here it was barely any more than 0.1sec. What had changed? "I think we just got more out of it," said tech director Willi Rampf. "This track asks for a lower-downforce configuration, and maybe that suited us better relative to the others." Robert Kubica in the sister car was knobbled right from the start by a fuel flap that came open. It doesn't sound so serious, but it actually creates a lot of extra drag, and the way it alters the airflow deprives the rear wing of much of its downforce. He quickly fell a long way back from Heidfeld in the first stint, though was able to keep himself just out of reach of a madly close train of cars comprising Fisichella, Mark Webber's Red Bull, Heikki Kovalainen's Renault, Jarno Trulli's Toyota and the two Williamses of Alex Wurz and Nico Rosberg. David Coulthard soon joined this group in a sparkling performance from near the back, putting pass after decisive pass on cars until he was up with his team-mate. Just as in Melbourne, and just like Kubica here, Webber's fuel flap was jammed open. Thus compromised, he didn't try to defend from DC, who after going by then put a great pass on Fisichella for seventh place. This was lap 31, halfway through the second stint. Fisi didn't look at all convincing in defence, especially when he also let the compromised car of Webber through. The performance of the Red Bulls was at this stage flattered by their shortfuelled stint duration, but it had nonetheless been good while it lasted. Unfortunately it didn't last long enough: DC went out with a broken driveshaft, Webber with a failed gearbox. 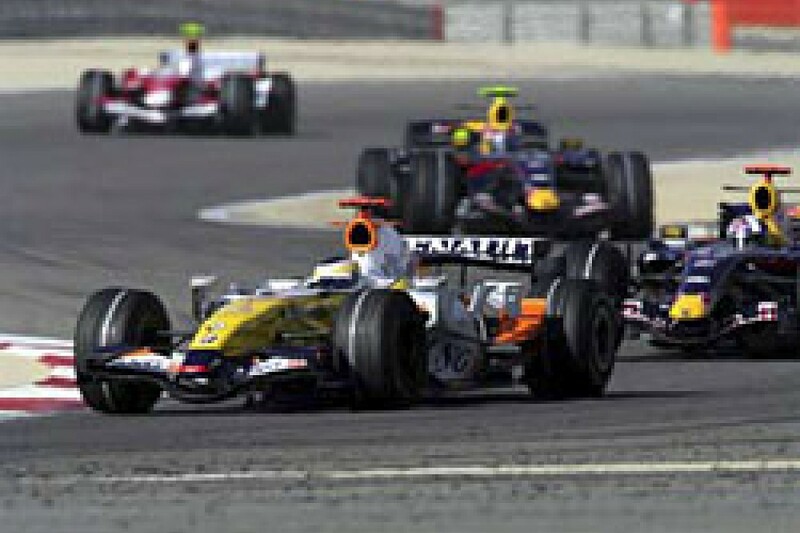 Trulli drove a spirited race, passing Kovalainen in the first stint and Fisichella in the second, then defending his seventh position hard from Fisi in the late stages. It had been a good drive, and confirmed Toyota as this weekend's winner of the closely-matched midfield that also comprises Renault, Red Bull and Williams. But it still left the Toyota almost a lap behind the winner. Through most of the short final stint, Hamilton was taking 0.5sec per lap out of Massa. In-car footage showed just how hard he was working on the relatively gripless surface, yet still the gap came down. Into the final lap it was less than 3sec. But Massa had it all covered. The 'number twos' had finished onetwo, their disgruntled team-mates back in third and fifth respectively. So are Massa and Hamilton now equal number ones? Massa: "I think we will not see any decision until we see the championship is almost done. At the end of the championship it's the best thing for the team if we are fighting between us." Hamilton: "I don't see why not. I have the same car and I seem to be as competitive as him, so as long as I can keep up this consistency. I feel a lot more comfortable knowing that a win is going to be possible." On Sunday, they each made their teams' decisions very, very difficult.